✓Easy to use and clean, very flexible, non-toxic, reusable. properties, making demolding essentially trouble free. ice cream, gelatin, jelly, chocolate, candy and more. ✩Dream Catcher Silicone Mold: sturdy and flexible silicone, US FDA quality, without BPA, non-toxic environmental protection, temperature -40 ℃ to +230 ℃. ✩Dream Catcher Butterfly Cake Topper : DIY Handcraft Silicone Mould, Sugar craft, Cake Decorating, Fondant, Soap, Chocolate, Cake Toppers, Clay etc. ✩Big Feathers Silicone Mold : with "Non-Stick" characteristics, colorful, fun, low carbon, environmental protection, organic material can be recycled, low energy consumption. 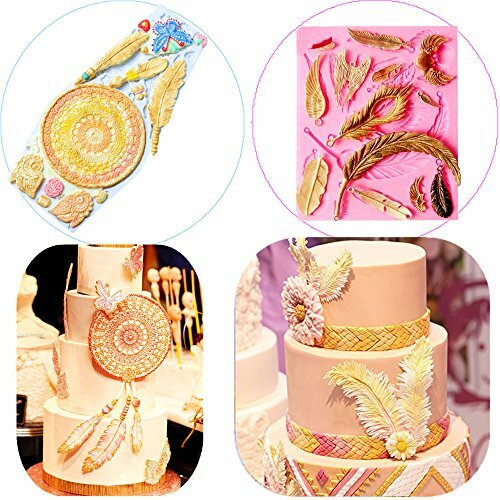 ✩Fondant Mold: package include 1 x Dream Catcher Butterfly Mold, 1 x Big Feathers Silicone Mold. Soft and easy to use, Handy and washable (Hand Wash Only). ✩Cake Decorating Tool: If you are unhappy with your order for any reason please contact me right away. Keep you happy is our priority!